Welcome to Crooked Lake Resort & Bait Shop,in Lake Michigan. and 4 bedrooms,also Sofa Sleepers as well.Cabins sleep from 2-10. Michigan ,in the Village of Lake.I the very center of Michigan. tackle,fishing & hunting,ORV & snowmobile permit license here. grill ,fire pit , picnic table, lawn chairs. 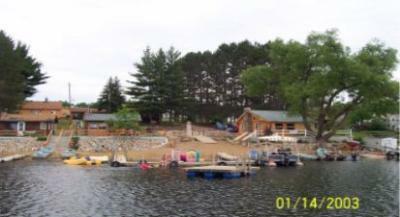 Cabin #2 on the Lake.Has 2 bedrooms + sofa sleeper.Sleeps 4-5.
kitchen.bathroom with shower,dinning area sun porch. picnic Table,charcoal grill, lawn chairs,fire pit. Rate is $115.00 per night $230.00 weekend,$805.00 weekly + tax. Rate is $135.00 per night. $270.00 weekend,$945.00 weekly + Tax. kitchen, dinning area,bathroom with shower,sun porch. Cabin #5 Has 3 bedrooms + Loft + sofa sleeper . Sleeps 8-10.
kitchen dinning area,bathroom with shower,sun porch. kitchen.dinning area,bathroom with shower+ tub.